A final reminder about or quiz tonight, with Redemption Brewery beer and Wildes Cheese. We've had two teams pull out, so if you want to come along, you still can. It's £15 for a team of four (this price includes 4 bottles of beer and a cheese platter courtesy of Wilde's Cheese). If you don't think you'll be able to get together a full team, don't worry. You can either join another team, or you can be in a team of 1, 2 or 3. We will charge you £3.75 per team member. THE WINNING TEAM WILL GET £50 TO SPEND ON BOOKS! It starts at 7.30pm and your quiz master is illusive Twitter legend Greg Stekelman (@TheManWhoFell). There's also a special 3 for 2 on all books for everyone who turns up tonight!! All the information about the quiz can be found HERE. 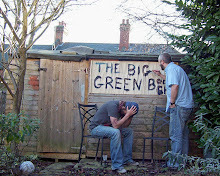 Please call us (020 8881 6767) or email (enquiries@biggreenbookshop.com), if you want to come along.